BC Athletes to Speak Out Against Tobacco UsePacificSport registered athletes to share “be your best. be tobacco free” message(September 11th , 2007) – The Tobacco Free Sports (TFS) program has a new face – nine new faces to be exact. Starting this month, the Tobacco Free Sports program, a provincial initiative funded by the Ministry of Health in partnership with PacificSport, Alcohol Drug Education Services (ADES) and Vancouver Coastal Health (VCH), will have nine PacificSport registered athletes representing the program as the Tobacco Free Sports Athlete Ambassadors. This energetic and dynamic group, representing all regions of the province, has been prepped with professional public speaker training from the Esteem Team, a national non-profit organization that promotes athlete role models to inspire youth to achieve their life goals, as well as tobacco use prevention information from Vancouver Coastal Health. The athletes will be speaking at a variety of sporting, non-sporting, school and community events, weaving their personal sport story into the risks and effects associated with tobacco use. ActNow BC is a partnership-based cross-ministry health and wellness initiative that promotes healthy living choices to improve the quality of life for all British Columbians. 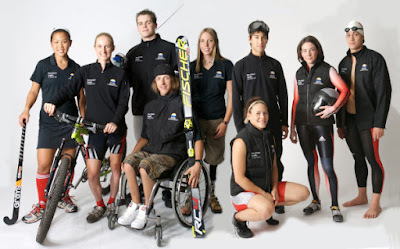 For more information about the TFS Athlete Ambassadors, or to inquire about booking an Athlete Ambassador for an event, contact Janet Filipenko, Program Coordinator at jfilipenko@pacificsport.com or 604-730-7273. Stacie Anaka (Victoria - Wrestling), Michelle Bartleman (Sea-to-Sky Corridor - Skeleton), Josh Dueck (Okanagan - Para-alpine Skiing), Andrea Dziewior (Vancouver Island - Para-alpine Skiing), Spencer Landsiedel (Fraser Valley - Swimming/Modern Pentathlon), Ali Lee (Victoria - Field Hockey), Callum Ng (Vancouver - Swimming), Catharine Pendrel (BC Interior - Mountain Biking), and Chris Wong (Northern BC/Vancouver - Freestyle Skiing). Hey!! Saw your photo on Pac Sport.. nice one!! !